Just in time for Mother's Day, Cara Group has a deal on their Ultimate Diining Card! Buy an Ultimate Dining Card of $25 or more in-restaurant and get $175 in coupon savings through a Bonus Free Ultimate Value Pack! 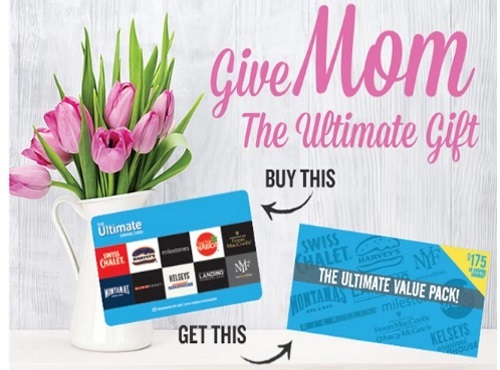 Ultimate Dining Card is just that, the ultimate gift card to use at 10+ restaurants including Swiss Chalet, Eastside Marios, Milestones, Montana's, Harveys, New York Fries and more!